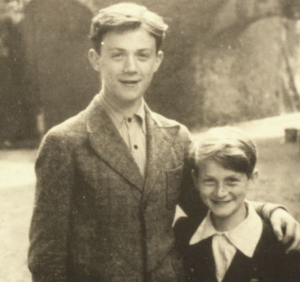 Bernard Rotmil (left) and his younger brother Charles in Brussels. I’m currently reading the epic novel “All The Light We Cannot See” by Anthony Doerr, a fascinating page turner that takes place during WWII. My father Bernard and his younger brother Charles endured similar circumstances as the young Marie-Laure, running from madness, trying to find their ground without parents nearby. As I languish in the throes of a new year funk, unable to write, and losing touch with my goals, I turn to my late father to be my guest writer for the day to describe the chaos he and my uncle Charles had to endure as children during this horrendous time in history. Pardon the typos, if there are any.